Since inclusion of the ZZF into the Leibniz Association in 2009, the collection of written and other materials belonging to the original institute founded in 1992 under the name Forschungsschwerpunkt Zeithistorische Studien (FSP – Contemporary History Research Focus) is being successively archived. 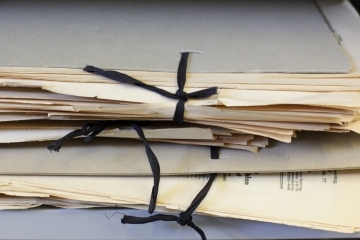 This page contains the User Regulations (pdf, in German) for the ZZF archive as well as the institute’s Archive Regulations (pdf, in German). The documents stored in the ZZF archive may be freely consulted and used for research purposes, provided there are no legal restrictions and user regulations are complied with.